Hallee, Inc., of Santa Cruz, Calif., is recalling about 1,000 bed canopies. A child can become entangled in the bed canopy, posing a strangulation hazard. The firm has received one report of a child waking up with the bed canopy netting entangled around his neck. No injuries have been reported. 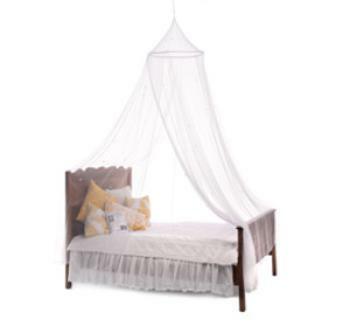 This recall involves all Hallee Starlit Nights Mosquito Net Bed Canopies. The recalled bed canopies are made of 100% white polyester fabric and mosquito netting and have glow-in-the-dark stars sewn onto the fabric. The canopies hang from the ceiling or wall above a bed and measure about 400 inches tall, 90 inches wide and 22 inches in diameter. “Hallee” is printed on the label that is attached to the bottom of the canopies. The canopies, manufactured in China, were sold exclusively online at www.Amazon.com from July 2016, through August 2016, for about $45. Consumers may contact Hallee at 800-265-5694 from 9 a.m. to 5 p.m. (PT) Monday through Friday, by email at safety@halleeinc.com or online at www.HalleeInc.com and click on “Product Recall” for more information.